Thanksgiving is upon us once again, reminding us that it’s important to slow down and be grateful for the many blessings in our lives. The people we love and appreciate always top our lists—family members, friends, and those we know who brighten our days in large or small ways. For business owners, customers certainly also place high on the gratitude list. In another post, we wrote about a Harvard Business Review study that showed what consumers want most when it comes to customer service is to have their requests fulfilled or problems solved quickly and easily. Consumers want it to be easy to do business with you, and if it isn’t easy they don’t feel valued by you and are less likely to stick around. Each one of these customer service actions shows your customers that you care about them enough to have the people and resources in place so that you’re not wasting their time or making them jump through hoops to connect with you. Here’s some evidence backing that up: 75% of people polled in a Consumer Reports National Research Center survey said the most irritating customer service experience is when they “can’t get a live person on the phone.” Rude customer service tied at 75% as a leading complaint, followed by “a long wait on hold” and “many phone-menu steps needed” ranking at 66%. 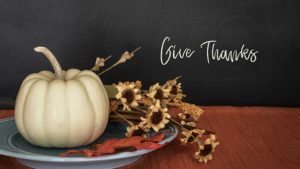 The easiest way to show your customers that you are grateful for their business well beyond just a thank you card is to have a live answering service on your team. Your customers’ calls will be answered by a professionally trained, friendly receptionist each and every time they call. Receptionists at an answering service are trained to listen to your clients carefully, any time of the time of day or night, and to answer common questions, schedule appointments or take orders, and tell them what will happen next if another action step is in order. Because call answering services have both the staffing and advanced technology, every caller is greeted by a live operator, 24/7. No call is missed, and customers aren’t irritated by being put on hold for long periods or being sent to voicemail. Simply put, having a live answering service on your side is a declaration of gratitude for your customers that will also help grow your business and increase revenue. Now that’s something to be thankful for. Voice Link of Columbus, Inc. provides live answering services that exceed your expectations with no hidden fees and flat rate month-to-month service agreements. Customized communication solutions, appointment scheduling, and secure messaging save you time and money while increasing customer satisfaction and loyalty. Request information online or call us at (800) 262-2799.